Or was he just out drinking all night? 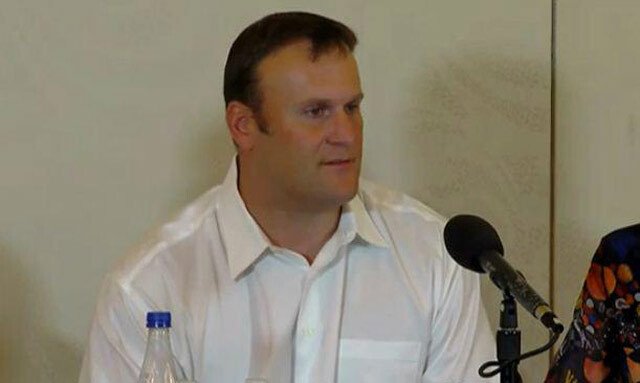 Ex-Miami Dolphin Rob Konrad at press conference discussing his 16-hour swim for survival. With circulation under 100,000, Charlie Hebdo will print 3 million of its next issue (featuring a Muhammad cover). The NBA’s highest payroll and a 16-22 record won’t prevent the Nets from selling for a premium price. Brad Pitt, Christian Bale, and Ryan Gosling to star in film version of Michael Lewis’s The Big Short. Not exactly targeting the teen and young adult market: Woody Allen to make half-hour series for Amazon (ticker AMZN). Ex-Miami Dolphin Rob Konrad resurfaces with tale of 16-hour survival swim. US Dept. of Health and Human Services flies first class to the tune of 31 million taxpayer dollars. This entry was posted in The Loony Bin and tagged Rob Konrad. Bookmark the permalink.